Lately, I've been having a few up and down days, but today I've actually had a really good day! So in relation to my good and positive mental health day, I wanted to share the things with you that make me happy. Some of these may sound really silly or weird, but I don't care - but I hope you enjoy this post! Reading - I absolutely love reading, and it's something that I have loved since I was a child. I'm always on the hunt for new books to read, but at the moment I'm reading: Great Expectations by Charles Dickens (Thanks Con!) and We're All Mad Here by Claire Eastham. Reading relaxes my brain so much and brings me out of my world and into some quiet and content state which is perfect if I'm feeling anxious, or I really need to get some sleep. The sound of rain - The sound of rain to me is so relaxing and there's nothing more than being all snuggly on a crappy, rainy and grey day and hearing the rain come down against the window. I must admit, sometimes when it's heavy rain I open my window, because it is just a really nice sound to me. Retail therapy - Ah, what I really like doing after a bad mental health storm but my bank balance does not like it at all. I like doing a spot of shopping after I've had a bit of a bad day, because I feel like I'm taking time out of my day to look after myself and treating myself for dealing with my different mental health issues and struggles which I've had for so long. The smell of my boyfriend's aftershave - I honestly love the smell of this so much, and it is actually such a relaxing and heart melting scent. It makes me feel so happy, relaxed and at home. Simple, but truthful. A hug off my gramps or mum - As I've been told time and time again, there's nothing better than having a hug off your mum to make you feel better. For me, it's off my mum or my gramps. It makes me feel like everything is okay and that I'm okay. Writing - Whether it is a blog post or a bit of a drabble, I love writing. I've always loved writing little stories, and for one mother's day I actually wrote my mum a story (now that I think about it, it's so cringey). I've used it as my escape from my mental health, as explained here in a previous blog post, but I know for a fact I will never get bored of writing. Listening to music/going to a concert - I remember that the year my parents separated, I went to 13 concerts in one year and it helped me get over the fact that my dad was no longer around. In all honesty, whenever something has gone wrong, I turned to music as my support when I felt like I couldn't turn to anyone or I didn't really have anyone to talk to. I still love music and going to concerts even now, as I feel like it is one of my few 'safe spaces' that I have and I feel like I can escape my problems, even if it is only for an hour and a half. Beaches - I love beaches because I love going on walks, as well as the fact that I find beaches so relaxing and really pretty. Watching things - If it's a YouTube video, an episode or two of something on Netflix (usually Fresh Prince of Bel-Air) or even a cheesy feel good movie, I just love to watch things. It helps me unwind or distracts me from how I'm feeling, which is what I like in things. I also love watching videos on Instagram of puppies and this instantly helps my bad mood, or if I'm particularly feeling a bit depressed one day. Playing games - Doing this honestly makes me feel so relaxed, as well as taking my mind off things in life. Some of my favourite games are: Call of Duty, Prison Architect, Gary's Mod (particularly Prop Hunt), Skyrim, Minecraft, Runescape, The Sims, Fallout 4, Battlefield 3 and Batman Arkham Asylum. A cuddle with my boyfriend - I honestly love this a lot, because no matter how crappy I'm feeling, a cuddle off my boyfriend just makes me feel so much better about everything. In that moment, I swear all the negativity has been sucked out of me and has been taken away and all I feel is warmth, love and being content. 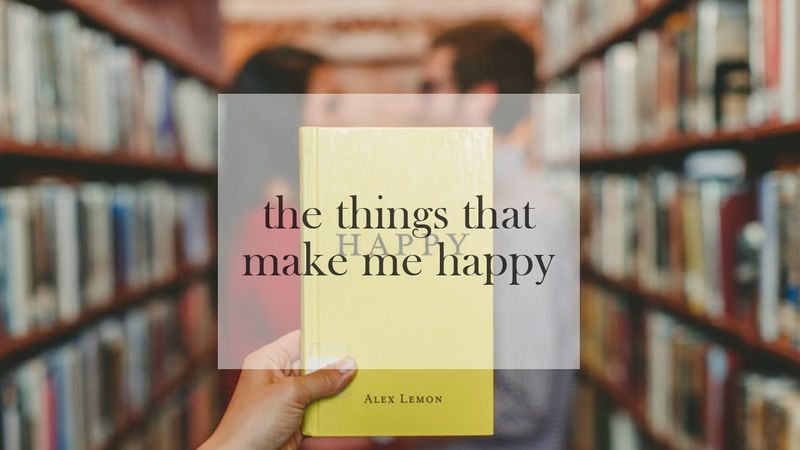 What are some of the things that make you happy? Let me know in the comments! The quality of my phone for photos honestly baffles me, it's so good! Haha, you love me really! I absolutely love the sound of rain too! In fact, I usually listen to a recording of light rainfall from YouTube when I'm working or trying to get to sleep as I find it super relaxing! And OMG Instagram videos of puppies are always a winner! Especially dachschunds, they're my absolute favourite! I think I need to start using that, or ones of waves! Aw, I agree with the dachshunds, they're absolutely adorable as heck! I feel like the rain one is pretty common with a lot of people, which is understandable! Aw, thank-you so much for that, Adele! That really means a lot to me. Being out in the rain really is 50/50 for me, but the sound of it is so relaxing! Loved this! I can relate to soo many of these, I love just curling up in my blanket with a good book. Along with cuddling with the partner, he always makes me happy and calm, an amazing feeling! Blanket and a good book is so perfect for me, especially if I want to wind down and relax after a busy day of working! So glad you liked the post, lovely.